Picture it: The winter of 2007. Early December in St. Paul, Minnesota. Temperatures hovering around 20 degrees Fahrenheit. A light snow falling. Me, standing on a cold, icy ladder swearing under my breath because I can’t figure out why my damn holiday lights aren’t working. Why didn’t I just hire someone to do it for me? I’m obviously an idiot who can’t string a couple hundred lights. That was the last time my house was festooned with holiday cheer. And if I’m anything like the customers in your green industry business, there’s a market out there for people willing to install holiday lights. Which might explain why more green industry businesses are starting to sell holiday lighting services. Is Holiday Lighting Right for Your Business? Will my existing customers buy it? If you’ve got customers asking you for holiday lighting services, this is a no-brainer. But if you don’t, consider who your customers are. Do they tend to put up holiday lights themselves? Are they older? Do you serve high-end neighborhoods with a lot of holiday lights? If you don’t know whether they’re a good fit, consider calling a few customers or sending out a simple survey to gauge their interest. Do I have the infrastructure in place to do it well? You need some infrastructure to simplify holiday lighting. Trucks, equipment, parts, and field service software are just a few of the things that simplify adding holiday lighting services to your business. If you have a lot of infrastructure - or the means to acquire it - it may be worth exploring. What’s the competition like? Is there a lot of competition? Do a Google search for Holiday Lighting in <CITY> and see what comes up. If your existing customer base is lukewarm about the possibility of your holiday lighting installation service, but there’s little to no competition in your market, it may still be worth the investment. Do I want to work in November, December and early January? A lot of green industry businesses get into snow removal and holiday lighting because they want to keep their employees busy over the winter. But others don’t. If you enjoy taking the winter off, and you’re happy with the revenue you’re currently generating, holiday lighting likely isn’t for you. Start with your existing customer base. That’s your easiest sale. 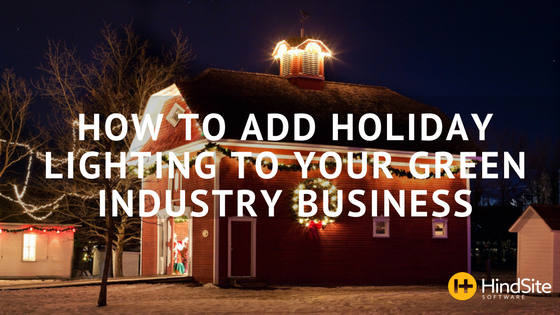 The year prior to offering holiday lighting services, start heavily marketing your holiday lighting. Every communication you send to your existing customer base, including invoices and emails, should include information about your holiday lighting services. If you’re a HindSite customer, leverage the power of our field service marketing add-on, HindSite Connect, to add information to your green industry appointment confirmations, reminders and completion emails. Examine every customer touchpoint like phone calls and technician/crew interactions to determine where there’s an opportunity to market to your customers. Buy some door hangers that you can distribute during the late summer/fall. Your irrigation winterizations or fall clean ups are a great time to distribute door hangers. Earlier is better, but most customers probably aren’t ready to think about holiday lighting until fall. Try Every Door Direct Mail from the US Postal Service if you want to target specific neighborhoods. It’s a relatively inexpensive way to target a specific area, so you can limit your installation drive time between properties. Next, you’ll want to consider your pricing model. I’d start by considering your local market. Ask a friend to call a couple holiday lighting businesses for a quote so you can get a general idea. According to Promatcher, the cost of light installation for a flat rate is $303.51, the hourly rate is $60.23 and the cost per linear foot is $3.18, plus the cost of lights, if not included. The average cost for light removal is $50.89 or $160.91 for a flat rate. Also, consider other ways to make money. Some holiday lighting businesses sell the lights and installation. When the lights aren’t on the house, they store them, charging a small monthly fee (in the $10 neighborhood). If you have the warehouse space, put it to use and earn some money when the lights aren’t hung. Also, don’t be afraid to add a nice markup to your lights. I’ve heard from a number of contractors that mark up the cost of lights by 50% or more. Holiday lighting installation can be a lucrative business and extend your ability to generate revenue a couple months. It’s a good way to keep key employees working over the winter so you don’t lose them. If you’re not currently offering holiday lighting, take some time this offseason to consider if it’s a good fit for your business.